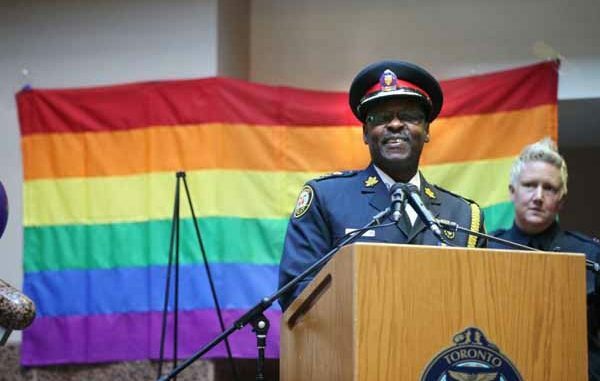 The gay community in Toronto received something extraordinary on the eve of Gay Pride. The current Police Chief apologized for their role in the bathhouse raids 35 years ago. For a bit of background go to Toronto Bathhouse Raided The 35th Anniversary. While some thought this was long overdue, others felt it was a dollar short, as it wasn’t an official apology. In fact the words “apologize” and “sorry” was not even uttered or even mentioned. Rather the narrative was one of “regret”. As in the police were regretful as to what had happened 35 years ago. In addition there was a raid over a decade ago at a women’s bathhouse night, and no apology was offered for that raid. But one can hope one will come soon. Anyways there are so many articles about this historic apology they will be listed here for you to go through. Police apology too little, too late? Mark Saunders expressed ‘regret’ for the Feb. 5, 1981 raids, which resulted in hundreds of arrests. Two men reflect on their experiences during the 1981 raids by Toronto police. With Pride month starting, the Star speaks to Margaret Atwood about her speech against the 1981 bathhouse raids.